This 1:10,000 scale (2 x vertical exaggeration) Participatory 3D Model (P3DM) represents the Wechecha Mountain Complex, Oromiya Regional State, adjacent to Wolmera and Sebeta Awas Woreda, Ethiopia. It was completed in year 2009. 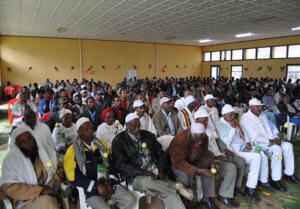 It measures 2.4 x 2.8 m (672 km2 on the ground) and is the 2nd P3DM made in Ethiopia after the one in Bale. The objective of the exercise was to document the Traditional Ecological Knowledge (TEK) of resident communities, and add value and authority to it in order to increase the value external authorities would attach to it when it comes to collaborative natural resource management. A second objective of the exercise was to enhance the transfer of TEK the younger generations. Over 40 students and representatives from youth groups constructed the blank model. 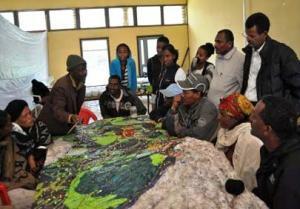 Residents of the area, especially elders, were invited to populate the map with their spatial knowledge. In the process information about the mountain area has been shared across generations and between local communities and other stakeholders, opening the door for deeper discussions on the sustainable management and safeguarding of both local culture and environment. The local Governors were very supportive. They played an active role in the process together with the organisers.